Photographer Graham Dyer was traveling in the Central Kalahari Game Reserve in Botswana, South Africa, searching for some inspirational material to photograph. What he ended up finding was an incredible encounter between two unique species. 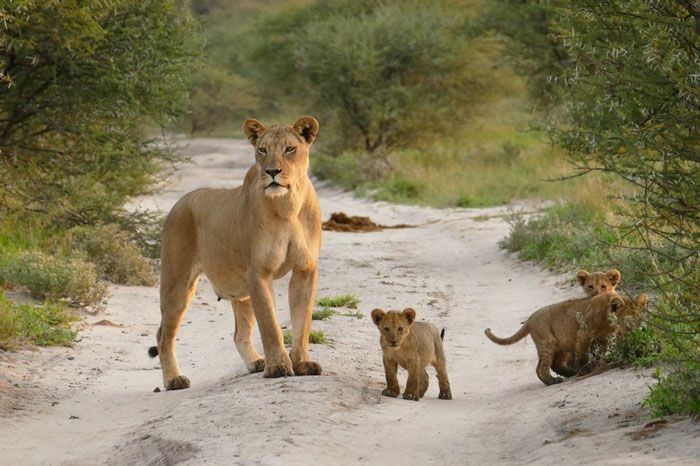 In the Sunday Man portion of the park, Dyer observed two lionesses, three cubs, and one male near a watering hole. 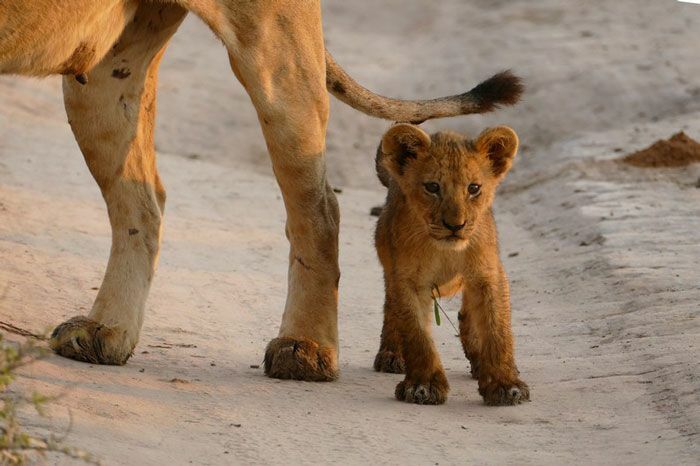 Part of the pride began to walk southward. 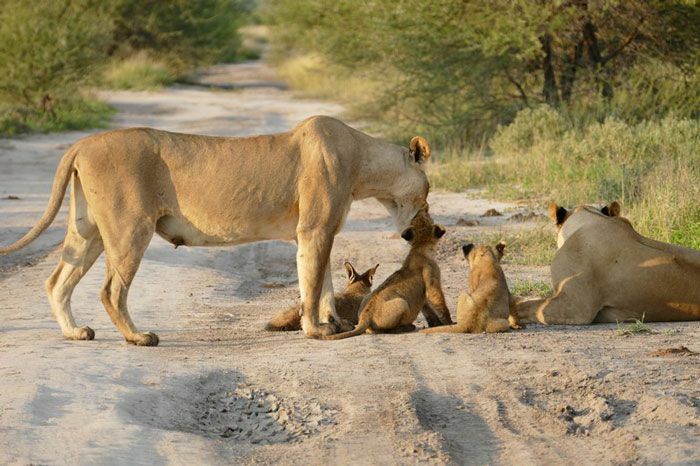 As Dyer started taking pictures of the lions, he suddenly heard loud alarm calls from one of the lead lionesses. 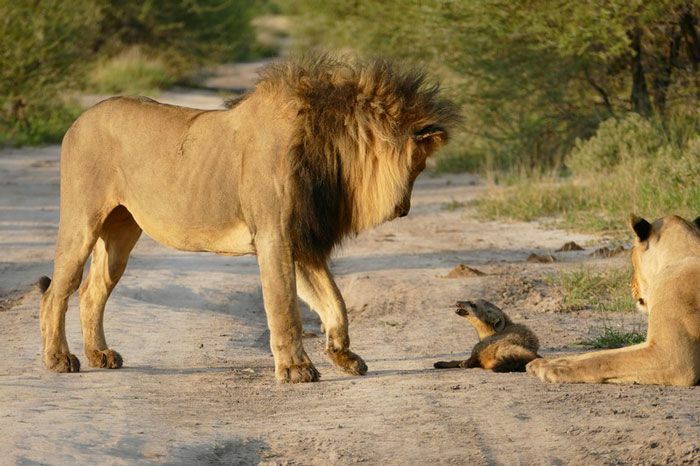 As he approached the scene, he saw a bat-eared fox on the road, ears pinned back, defending itself from a lioness. To Dyer, it looked as if the fox had injured its legs or spine, and it couldn't move from its position on the road. It has still valiantly protected itself when the lioness got too close: he had bitten her on the nose! This fox definitely had some attitude. According to Dyer, the fox chattered away in anger at the lions for almost six minutes, and continued when any lion came near him. 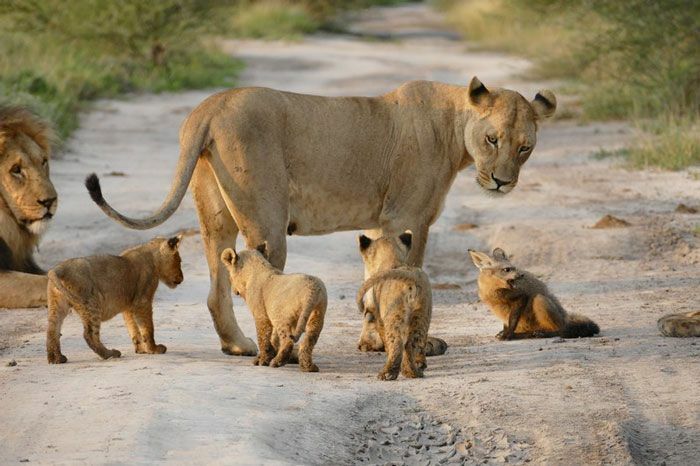 The lioness and her cubs were both intrigued and confused by the fox. Unfortunately, the fox also caught the attention of the male lion who slowly wandered over to see if the fox was worth his time. 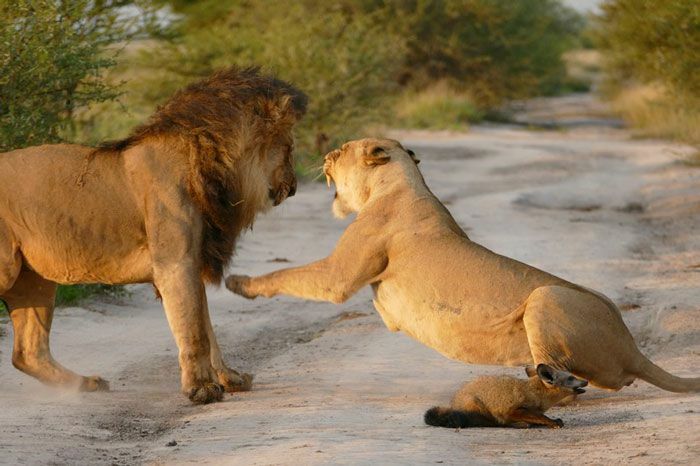 But when the male lion approached the injured little creature, the lioness did something amazing. She stepped in to protect the fox! 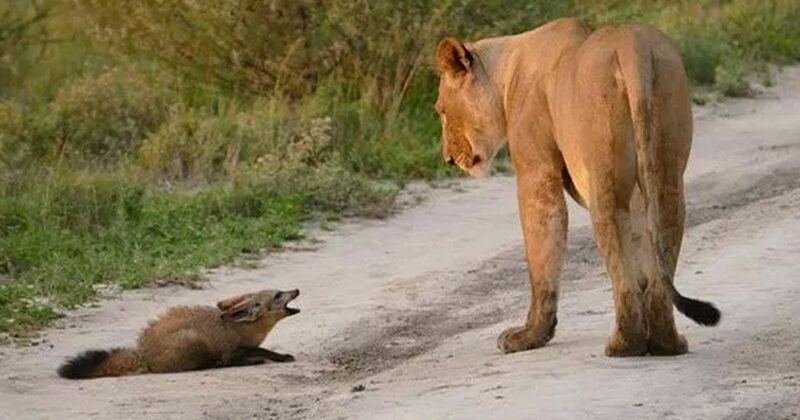 Dyer writes, "The lioness didn’t really know what to do with the fox but was defensive of it, even striking out at the male when he approached too closely." The male and the female lion roared at each other for a few moments. Then the male gave in and wandered over to examine his cubs. The lioness lay down next to the fox, continuing to protect it. To Dyer, it seemed as if the lioness treated the fox as a new cub, warding off threats from the male lion. Then sounds in the distance indicated another pride had a fresh kill. All the lions around the little fox raced down the road, with the lionesses and the baby cubs bringing up the rear. The fox was left in the road, contemplating his experience. Although Dyer feared the fox was gravely injured, a short while later he reported, "Although at first it appeared to have a broken back or pelvis, it eventually was able to stand up unsteadily on its back legs, so it may have just been badly bruised. Two jackals approached it when we checked up later but it was aggressive so they left it alone. The fox was last seen lying head up in the grass, hopefully recovering." 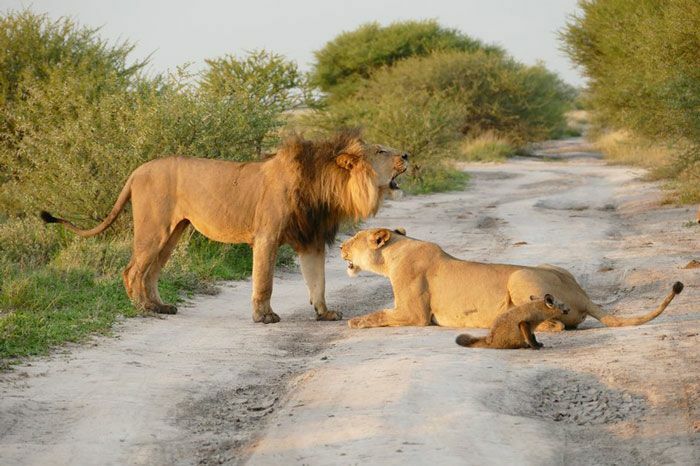 Dyer was grateful to have captured such an unusual encounter between two radically different species on this road in the Central Kalahari Game Reserve.